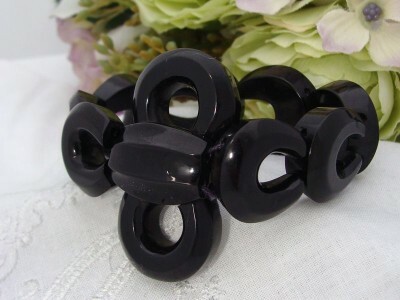 I have a real passion for Whitby jet jewellery which is due not only to its fabulous appearance & feel, but the history and significance of this natural material. I wear my own Whitby jet bracelet almost daily and have had so many compliments and questions about it. This is a beautiful bracelet and the pictures do not do justice to it. It is comprised of horse-shoe shaped pieces for the actual bracelet with the centerpiece shaped somewhat like a figure eight. Anyone interested in Victorian jewellery will know they were incredibly sentimental and this may have been worn by a bride on her Wedding Day for good luck. The pieces are threaded through with double strands of shirring elastic which would not be original as it would have perished long ago. Chips & nibbles to Whitby jet are typical due to its nature yet I can see no obvious ones. The Victorians were very sentimental and this was lead by Queen Victoria whose choice of dress and jewellery was highly regarded. She lived the last 40 years of her life in mourning after Prince Alfred died. She wore black clothing so black jewellery was the only choice. An entire industry grew around the mining and carving of jet, a fossilised coal found near the town of Whitby in England, hence its name. Imitations were made: French jet, a black glass and vulcanite, a hardened rubber, are just two of many. But they are not as valuable or as sought after as Whitby Jet. Whitby jet is a material that can no longer be mined which means it will become increasingly rare over years to come - a fabulous investment! Nearing Mint Antique condition! This stunning bracelet is simply beautiful & dates circa 1870-80s by design and styling so is approximately 130-140 years old! I can just see that the top has come loose at some point in the distant past so it has been reattached (not at all obvious). It presents beautifully with a shiny sheen and so much better than the pictures suggest. This is an ideal piece for any antique jewellery collection and is destined to become a treasured heirloom. These bracelets range from the high hundreds and into the thousands in antique stores and jewellers. This is offered with a very low price!